If you’re looking for the Art Gallery Fabrics Give Away it’s here. 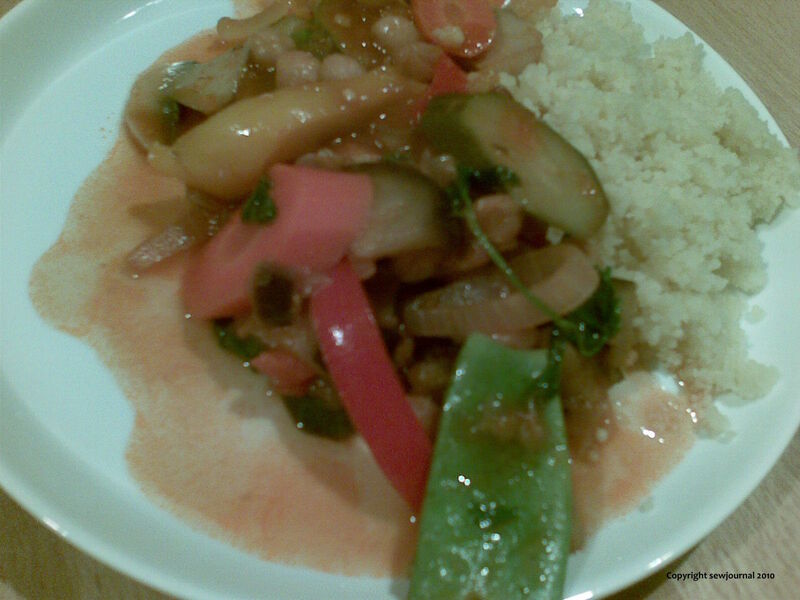 I bought some lovely eggplants the other day and so I thought I’d make a quick version of a Moroccan style vegetables and couscous. 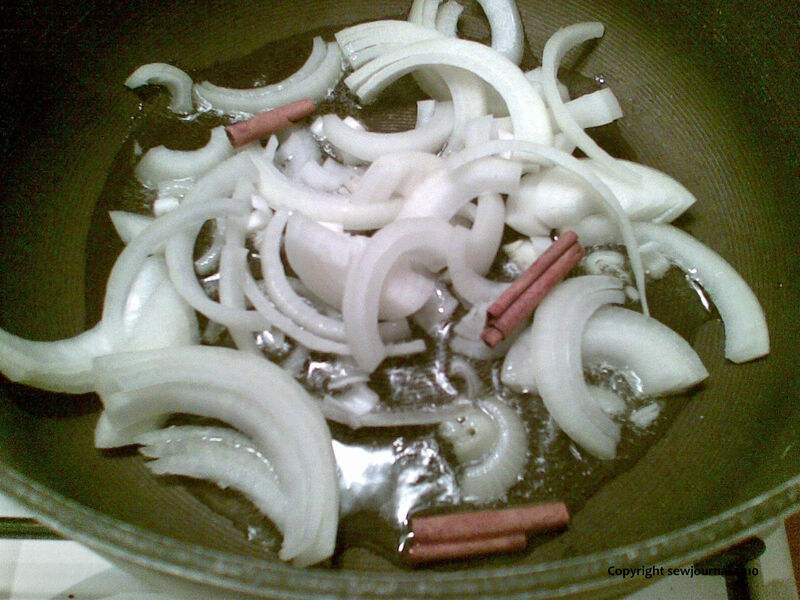 Add the onions and cinnamon to a pan with the oil and cook for a few minutes on medium heat until the onions start to soften. Then add the sliced mushrooms. Stir and allow to cook until the mushrooms are just starting to brown then add the eggplant. Stir well and let it cook for a couple more minutes then add the zucchini. Again, stir well and cook for a few minutes. Then add the carrots, tomato paste and enough water to just cover the vegetables and then add the stock powder. Add the chickpeas, bring to the boil and then simmer for about 5 minutes. Add the capsicum. ( By the way don’t fall for buying the three colours of capsicum in one of those nets. I priced it and it was twice as expensive as buying each one separately.) Allow another five minutes of simmering. If the carrots are cooked yet firm, switch off the heat and stir through the snow peas, tomatoes and coriander. Leave to rest while you make the couscous according to the directions on the packet. Before serving you can adjust the seasoning but I usually find I don’t need to. When you take the lid off the pan you should get a beautiful aroma of cinnamon which is why I prefer not to use other spices such as garlic with this dish, though you can if you want. 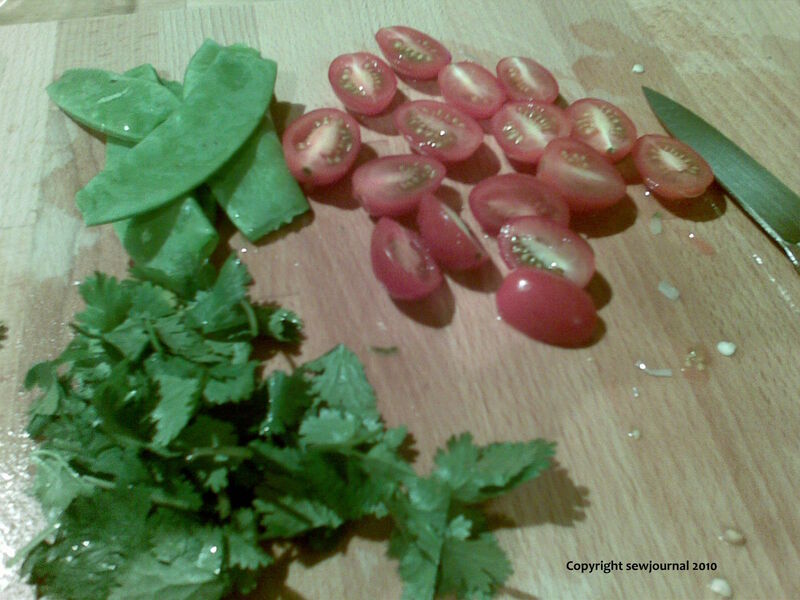 Serve and garnish with a little coriander if desired. Enjoy!